Call me a basic white girl all you want, but Nutella is one food staple that I can never really part from, no matter how hard I try. Nothing really rivals my love for the glorious hazelnut spread, so when I heard about Nutella face masks, I knew I had to give it a try immediately. When I’m not spoon-eating it out of the jar or spreading it all over sweets, I’m always on the lookout out for new ways to use this glorious gift to man. 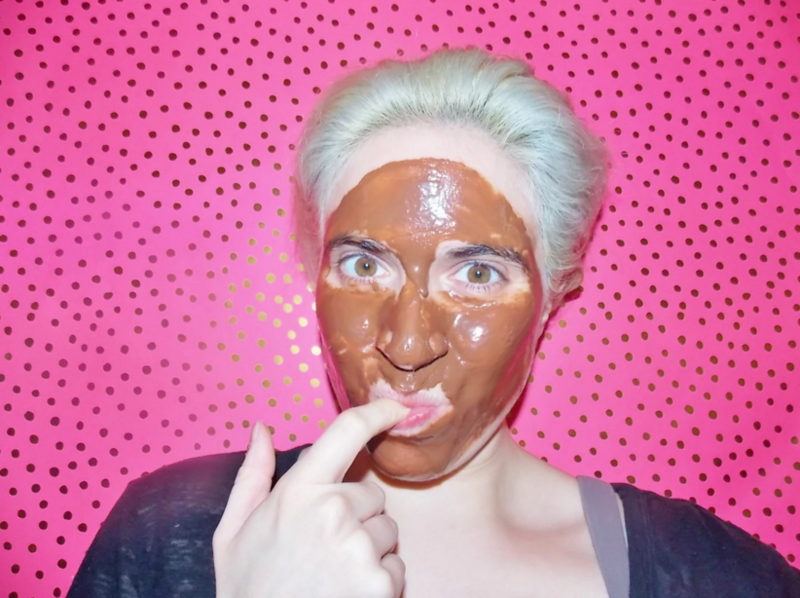 Sure, finding recipes for Nutella banana tempura was pretty eye-opening, but aside from finding quirky culinary uses of the hazelnut delight, I was a bit astonished to find that some vloggers have actually tried using Nutella as a face mask. OK, fine, I'm pretty sure this clip was supposed to be a joke, but considering hazelnuts have some serious skin benefits, I decided to take the technique very seriously. While I'm certainly prone to getting Nutella all over my face every once in awhile, never have I actually thought about actually using it as a softening facial mask. But being the curious beauty enthusiast I am, I was determined to see what would happen after slathering some hazelnut spread onto my face. Trust me, the results were pretty darn interesting. Unlike some DIY recipes, which usually call for a lot of ingredients, Nutella is the sole ingredient used for this face mask. And yes, the spread itself can be a bit on pricey the side, but compared to most store-bought face masks on the market, a $10 at-home facial seems like a real steal these days. For proper application, you can use a spatula to evenly apply the thick and creamy Nutella onto your face. But, I find that using your fingers works just as well. Don’t worry about mixing bowls or whipping together messy ingredients, as this is part is pretty darn easy. All you really have to do is open up the jar, slather some Nutella on your face, and wait a good 20 minutes. Yep, it's really that simple. Resisting the urge to maybe eat some Nutella may be challenging, but don't worry! You’ll definitely have enough product to put on your face, even if you sneak in a few spoonfuls. The application part of the process definitely feels weird, and reminded me of the time I applied worm poop cream onto my face. While this Nutella mask smells nowhere as bad as a facial cream made with insect feces, the consistency tends to feels like a thick gum paste on your face. But if you can get over the weird gloopy feel, this is probably the tastiest face mask I’ve tried. Since most face masks require a good 20 minutes to really work, I decided that'd be a solid amount of time to keep the Nutella on my face as well. While you could possibly leave this on a wee bit longer, I didn't want to piss off my usually temperamental skin. While it’s true that gooey Nutella just sits on your face, making you feel somewhat like the poop emoji, removing it can be a pretty tough situation. And while you could try to lick all off your face, sadly most human tongues can’t reach foreheads. As you can see, Nutella is just about as thick as molasses. So with that said, just one rinse under the sink isn’t enough. For a thorough clean, you’ll definitely need some hot water and a light cleanser (and maybe a Clarisonic!) to make sure your face is clear from any Nutella-induced breakouts. While my irritable and dry skin surprisingly wasn’t irritated by the Nutella face mask, it really didn’t provide any noticeable benefits either. Maybe my skin was a tad bit softer than before, but I wouldn’t want to use it every time I wash my face. Even though Nutella doesn't contain preservatives or artificial colors, I'm a little wary about what all that sugar would do to my skin in the long run. If you’re up for a head-scratching beauty dare, then covering your face in Nutella is a great way to try something new and unexpected. Of course, it won’t guarantee any noticeable beauty benefits, but it’s definitely one of those things you can say you tried, and of course brag to you all your beauty-loving friends about. But before you grab that jar off your nightstand (What? that's where I keep mine! ), let me offer you one more tip of advice. Don’t EVER try this beauty experiment when you’re hungry. The mouthwatering Nutella smell will only make your stomach growl even louder.